Goenkaji’s journey to deliver the message started in 1924 in Mandalay, the former royal capital of Myanmar. Less than 50 years before, a king still ruled there but the British had overrun the south. In their wake, a wave of immigrants entered the country from India, and one of them was Goenkaji’s grandfather. Like most of the newcomers, he was seeking his fortune. But he was an upright, honest man who was spiritually inclined; and though a Hindu, he quickly developed a deep respect for the Myanmar people and their traditions. He conveyed that respect to his grandson. When he was a child, Goenkaji recalled, his grandfather took him to the famous Maha Myat Muni pagoda on the outskirts of Mandalay. There the old man sat with eyes closed, engaged in silent contemplation. Meanwhile the boy waited and watched patiently, absorbing the atmosphere of peace. In the child, respect turned to a profound love for the land of his birth. That love never wavered throughout his long life. The boy grew up and graduated from high school at the top of his class. Although the idea of continuing his studies was attractive, he dutifully entered the family textile business. Then the cataclysm of the Second World War intervened. As the Japanese army invaded Myanmar in 1942, Goenkaji helped to lead a large group of family members overland through mountain and jungle to safety in India. They were more fortunate than the thousands of people who died on the arduous journey. The family spent the war years in southern India, where a friend helped them to make a new start. After the Japanese defeat and withdrawal, they returned to Myanmar. 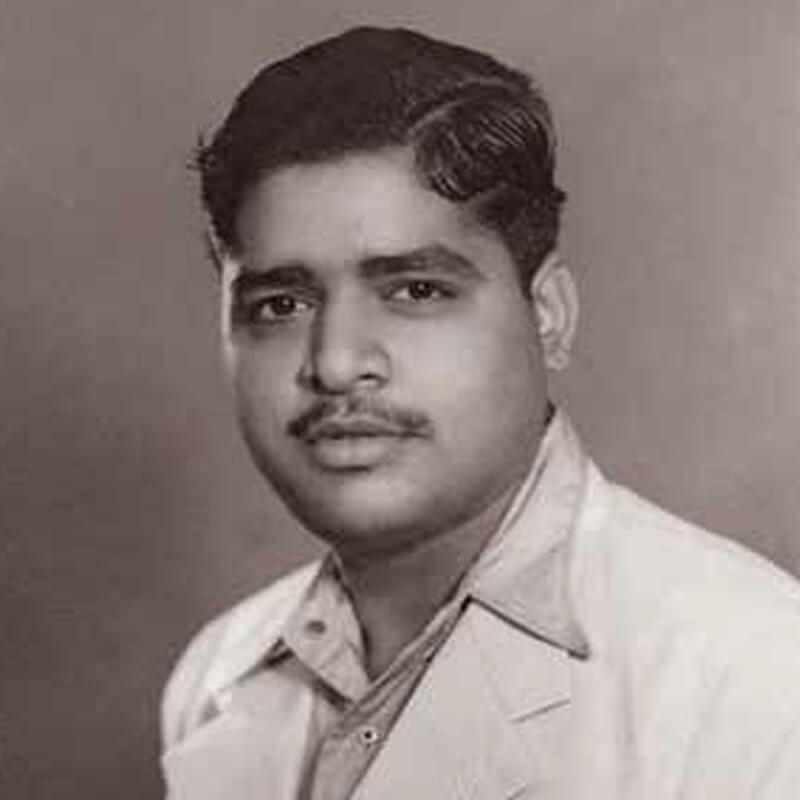 By then Goenkaji was in his 20s. He quickly showed his extraordinary flair for business and became a leader of the Indian community. But as he has often recounted, wealth and prominence gave him no peace. Instead, mental tension triggered debilitating migraines that could be treated only with doses of highly addictive morphine. Goenkaji traveled to consult doctors in Japan, Europe and America; none of them could help. It was then that a friend suggested going to the International Meditation Centre in northern Yangon, established a few years earlier by Sayagyi U Ba Khin. Born into a poor family, U Ba Khin had risen to become a top-level civil servant in the government of Myanmar, renowned for his integrity and effectiveness. At the same time he was a lay teacher of Vipassana, a technique of self-introspection that had been handed down from ancient times by the community of Buddhist monks in Myanmar. Goenkaji took his friend’s suggestion and arranged a visit to see the meditation center and learn about what was taught there. As the young man approached, U Ba Khin recognized that here was someone who would be instrumental in the fulfillment of his mission as a Vipassana teacher. Despite that, Sayagyi initially refused the visitor’s request to join a 10-day course. Goenkaji had frankly said that he was seeking relief from his migraines. “You are devaluing the technique if you come to cure a physical disease,” said U Ba Khin. Goenkaji agreed. After hesitating a few months, in 1955 he attended his first course. Though he wanted to run away on the second day, he persevered and found benefits he had never dreamed of. For the rest of his life, in his morning chanting he would express his deep gratitude to Sayagyi U Ba Khin. In the end, the threat to his life was dropped and Goenkaji entered what he later called his golden years. Freed from business responsibilities, he spent more and more time with his teacher, immersing himself in the Dhamma, the teaching of liberation. For himself, he wanted nothing more than this. But U Ba Khin had other plans. He recalled the ancient prophecy that 2,500 years after the Buddha, the teaching would return from Myanmar to the land of its origin, India, and would spread from there around the world. 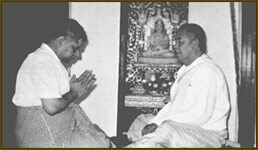 U Ba Khin’s dearest wish was to fulfill the prophecy by re-establishing the technique of Vipassana—the essence of the Buddha’s teaching—in India. Unfortunately, in the 1960s, the Government of Myanmar did not normally allow its nationals to go abroad. But since Goenkaji was of Indian descent, he might be given permission. With U Ba Khin at his elbow, for the first time, Goenkaji gave the discourses that were to become so familiar. Since the course participants were Indians, he spoke in Hindi. Sayagyi understood the language even though he did not speak it very well; every so often he would lean over and whisper to Goenkaji, "Now tell them about some of the disciples of the Buddha! Tell about Mother Visakha! Tell them about Angulimala!" And Goenkaji would drop whatever he was saying to do as his teacher directed. Later he would say that for him, giving one of his talks was like simply opening a faucet: without any effort, the words poured forth. Goenkaji was very aware that this was a historic moment. Still, he clung to the thought that his stay in India would be brief and he would soon return to his revered teacher and beloved homeland. In fact, more than two decades were to before he again saw Myanmar. He arrived in a country where few people knew him and the teaching of the Buddha was held in low regard. The very word “Vipassana” had been forgotten. But with the help of his family, Goenkaji was soon conducting his first 10-day course in Mumbai. Among the participants were his parents and a handful of other people, including a woman from France. On the last day, she invited Goenkaji to her country; he told her to ask him again in 10 years. The conditions were often rough; he had little money and less support; he was alone since his wife Illaichi (called by meditators “Mataji”) had remained behind in Myanmar at first. Yet he radiated joy—the joy of someone doing what he had been born to do. At the end of a course, he gave a closing talk and meditated with the students for a few minutes. Then he walked out of the hall, continuing to chant in Hindi, “Saba ka Mangal ho—May all be happy, may all be happy.” Slowly the sound of his chanting faded away. The meditators were back in a shabby room somewhere in an Indian city, with street vendors crying their wares outside, dogs barking, friends or loved ones to meet, letters to read, trains to catch, plans to make. But for many of them, something had changed. Life would never be the same. Goenkaji kept reporting back to his teacher, and U Ba Khin took great pleasure in his letters. On one course there had been 37 students, and U Ba Khin was delighted: “Thirty-seven for the 37 factors of enlightenment! ” he said, referring to a term in the ancient Pali texts. He was still more pleased when Goenkaji reported that he had conducted a course for 100 students. Little did anyone imagine that some day that would be considered a small course. Goenkaji was teaching at the Burmese Buddhist Vihara in Bodh Gaya in January 1971, when a telegram arrived to tell him that Sayagyi U Ba Khin had breathed his last. “The light has gone out,” he told the students. He keenly felt the loss. But he soon realized that he was aware of his teacher’s presence more strongly than ever. It was as if U Ba Khin had finally joined him in India. From every pore flows gratitude, I can never repay this debt. Living the life of Dhamma, Serving suffering people, Sharing the happiness of Dhamma with all— This is the only repayment. So that is what he did. From the far south of India to the Himalayas, from the deserts of western Gujarat to the jungles of Bengal, Goenkaji continued on his way. The landscape changed, the faces changed, he himself would change and age, but the journey went on. The first two sites were obviously not appropriate, but there was one more to see. The car turned onto a rutted path, long out of use. It led up to a hill top dotted with huge mango trees that shadowed buildings dating from the days of the British Raj. Some of them were in poor repair, and goats wandered in and out of one bungalow. Behind loomed a bare mountainside. Goenkaji closed his eyes for a few moments. Then he said, “Yes, a suitable place.” At once the businessman traveling with him offered to buy the land. This was the start of what became known as Dhamma Giri, the Hill of Dhamma. The center started modestly, with a handful of mainly Western meditators taking up residence. They wrote to Goenkaji, asking how they should spend their time. He replied, “Meditate, meditate, meditate. Clean yourselves and clean the meditation center. ” They set to work first with scrub brushes and water from the well. Once they had space, they devoted six to eight hours a day to the real task of sitting. Soon more people arrived, and then construction started. Dhamma Giri officially opened in October 1976. The time had ripened, Goenkaji felt. The ancient prophecy—that the Dhamma would return from Myanmar to India—had come to pass. But the prophecy also said that the Dhamma would spread from India around the world. The task remained to fulfill those words. Before he could take up that task, Goenkaji needed to be able to travel to other countries. His passport from Myanmar was valid only for India. He had tried but failed to obtain further endorsements. Reluctantly, he realized he would have to change his citizenship and apply for an Indian passport. It was one more tie snapped with the country he still considered home, but as an emissary of the Dhamma he had to do it. To his surprise, it was not so easy to become an Indian citizen and get a new passport. Reportedly, undercover agents came to Dhamma Giri to see what Goenkaji was doing. At every step, there were delays. But at the very last minute the roadblocks were removed, and Goenkaji and Mataji boarded the plane for Paris. It was almost exactly 10 years to the day since he had arrived in India from Myanmar. That year Goenkaji taught two courses in France, followed by one in Canada and two in the U.K. Old students turned out in large numbers but there were also many people who had never before learned Vipassana. The following winter, some of them made the trip to Dhamma Giri. This became a pattern over the next two decades. During that time Goenkaji traveled yearly outside India. He visited not only Europe and North America but also Japan, Taiwan, Australia, New Zealand, Sri Lanka and Thailand … and eventually Myanmar, making his first return home in 1990. In all these places and more, centers sprang up dedicated to providing opportunities for learning and practicing Vipassana as taught by Goenkaji. 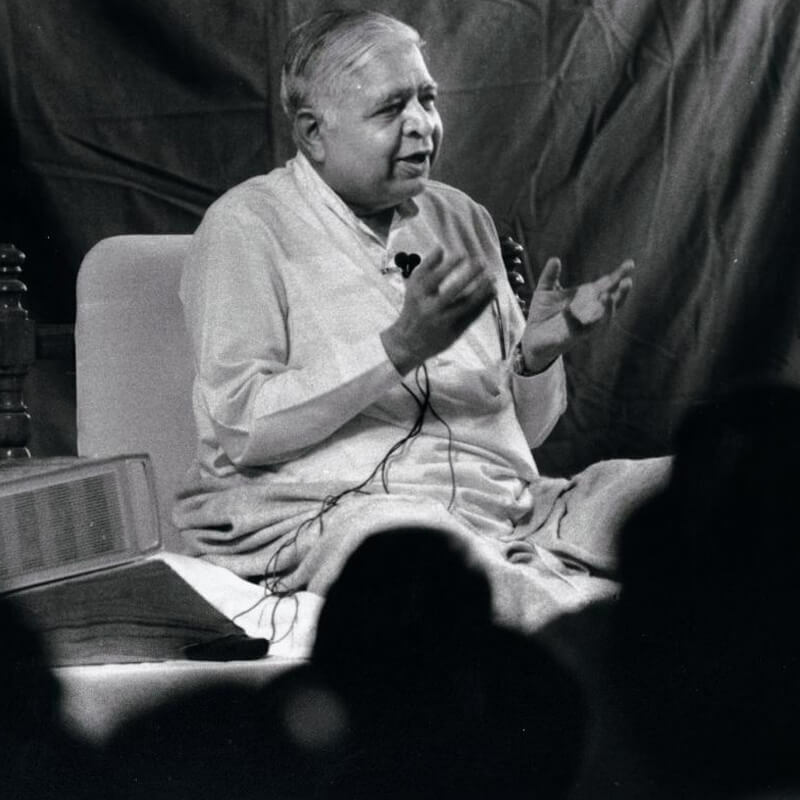 Goenkaji’s mission had taken a great leap forward, but now he faced a new problem: How could he serve the large numbers of people wanting to learn Vipassana? He taught alone, and even on a large course there was a limit to the number of students he could personally handle. There was only one answer. Starting in late 1981, he began training and appointing assistant teachers to conduct courses as his representatives, using recordings of his teachings. Fittingly, the very first 10-day course led by an assistant teacher took place at the Burmese Vihara in Bodh Gaya, the pilgrims’ guesthouse where Goenkaji himself had spent so much time. Within months, courses were being offered around the world. Today there are hundreds of assistant teachers conducting approximately 2,500 courses yearly for close to 150,000 people, at more than 150 permanent centers as well as in temporary facilities. 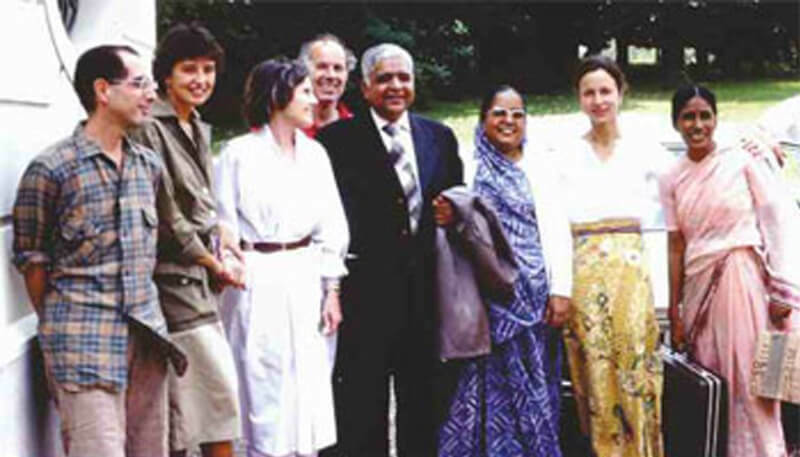 Beginning in 1994, Goenkaji also appointed the most experienced assistants as full teachers; there are over 300 of them around the world, guiding the program of courses and the centers where they are offered. The assistant teacher program enabled Goenkaji to focus on other large projects. He devoted more time to public speaking and appeared at many events, including the 2000 World Economic Forum in Davos, Switzerland. He founded the Vipassana Research Institute, which made the Pali-language Tipitaka—the oldest texts recording the teaching of the Buddha—widely available free of charge in the scripts of many different countries. He oversaw the development of an ongoing program of Vipassana courses for inmates at Delhi’s Tihar Prison and in many other correctional facilities, and he himself led the “Course for a Thousand” at Tihar in April 1994. He initiated a program of children’s courses. He wrote extensively on Vipassana and the teaching of the Buddha. And he inspired the construction of the Global Vipassana Pagoda on the outskirts of Mumbai. This slightly smaller replica of the Shwedagon Pagoda in Yangon is intended to attract many to learn about the teaching of the Buddha. It is also intended to be a lasting symbol of gratitude to Myanmar and to Sayagyi U Ba Khin for returning to India the gift of Vipassana. As the years passed, honors and awards poured in. Goenkaji received the titles of “Ocean of Knowledge,” “Torchbearer of Dhamma,” “Master of Doctrine,” “Great Lay World Teacher of Vipassana,” and more. The governments of Myanmar and Sri Lanka invited him as a state guest, and in 2012, the Government of India conferred on him the Padma Bhushan (“Precious Lotus”), one of its highest civilian awards. All of these, Goenkaji insisted, were really honors for the Dhamma. 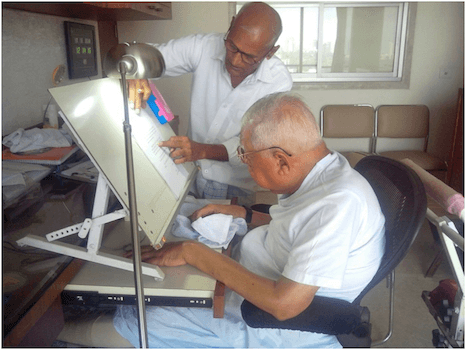 In the last years of his life, Goenkaji’s health was failing. He was confined to a wheelchair; that rich, thrilling voice became weak; speaking at length became difficult. But even as he experienced the sufferings of sickness and old age, he never set aside his task. To the best of his ability, he continued teaching the Dhamma and inspiring others to practice it. He could not stop his students from photographing him, although he teased them as they aimed their cameras. “What,” he would say, “don’t you have enough pictures of me?” Beyond the joking, he refused to allow his photo to be displayed in the meditation hall or any other public place at Vipassana centers. When asked whether he was enlightened, he would reply, “As much as I have freed my mind of anger, hatred or ill will, to that extent I am enlightened.” He never claimed that he had achieved any special stage; at most, he would gently suggest that he was a few steps further along the path than those who had come to learn from him. In 2010, he said, “U Ba Khin is more important than the person who brought Dhamma. People have forgotten the names of the messengers sent by Emperor Ashoka long ago to bring Dhamma to different countries neighboring India. So today in this new era of the Buddha’s teaching, people must remember U Ba Khin, U Ba Khin.” He did not care whether people would remember him. Following is a story told by Goenkaji in the closing discourse of a 10-day course. It has been lightly edited for publication. What would he do to examine them? He gave five grains of corn to each daughter-in-law and said, “I will come after four years. You have to preserve these five grains. If you cannot take care of five grains, how can you take care of all the money, the jewelry, the granary, etcetera? This is your examination.” And the old man went away. The eldest daughter-in-law thought, “The old man has gone crazy! For four years, why should I worry about those valueless five grains? I’d better throw them away. When he comes back, I’ll take another five grains from the granary and give them to him saying, ‘Take your five grains.’” She threw the grains away. The second one thought, “Yes, it is not good to worry about these five grains for four years. But who knows, these very five grains may have some wonderful, magical, miraculous powers. And after four years he will say, ‘All right, eat it!’ And when I eat it, I will get this or that supernatural power. I should not throw the grains away. I’d better eat them now. When he comes back, I’ll give him another five grains.” And she ate the grains up. The third one was very eager to get the bunch of keys. She kept those five grains in her room where she had the statues of her deities. And every day when she went to inspect the statues, she inspected the five grains also. She took care of the five grains all the four years. The fourth daughter-in-law took the five grains, cleared the land behind the house and planted them. When the time ripened, five plants grew with a hundred grains each. Next season, all those five hundred grains were planted. And the next season, all the grains were planted. In four years, there were tons of grains. The old man was very happy. This daughter had not only preserved the five grains; she had multiplied them. This old man has also given you five grains of Dhamma. Not only preserve but multiply them. And I won’t take the bunch of keys away with me; it remains with you. As you keep on multiplying Dhamma, you are able to open the gateway of the kingdom of heaven within, and enjoy. You can open the gateway of the brahmanic plane within, and enjoy. The gateway of nibbanic peace within, and enjoy. Keep growing in Dhamma, keep growing in Dhamma. Not to oblige anybody else—for your own good, for your own benefit. And also for the good and benefit of so many others, so many others. If walking on this path one can become an arahant, then what stage have you reached? Goenkaji: I have not reached the stage of an arahant. What stage I have reached I cannot say, there is no meaning in my saying. It is for you to judge. If all my behaviour in life is full of impurity, then I have not reached anywhere. But if you find something good in me, then certainly I have developed on this path. Could you please explain the meaning of ‘kalyānmitta’? Goenkaji: This is what I do: I keep practicing Vipassana. I keep teaching Vipassana. I make myself happy, I make others happy. I would like to know what was the defining moment in your life? The point where and when you felt that you had fulfilled your life’s purpose? Goenkaji - The moment I received Vipassana. When I received Vipassana on the fourth day in the camp that I was attending, it felt as if the insight of wisdom had suddenly awakened. Until that time all the spiritual talks I had heard remained at the mere intellectual level and I had deluded myself into thinking that I was gradually becoming detached and equanimous. However, the practice of Vipassana revealed true wisdom to me. Wisdom or knowledge spoken by someone else belongs to that person. It could not be my wisdom as I had not experienced it. My wisdom was awakened when I found the pathway of how to get established in wisdom and experience it for myself. That was the golden opportunity for me. 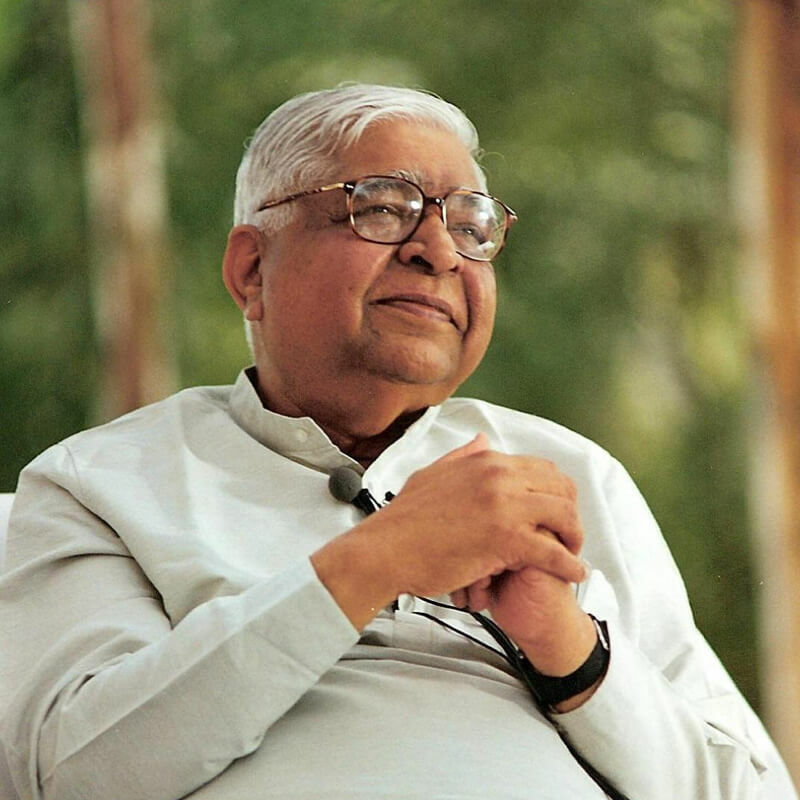 Mr. S. N. Goenka spoke to The Indian Express Editor-in-Chief Shekhar Gupta on NDTV's Walk the Talk on how Vipassana changed him and how he brought vipassana back to the country of its origin. 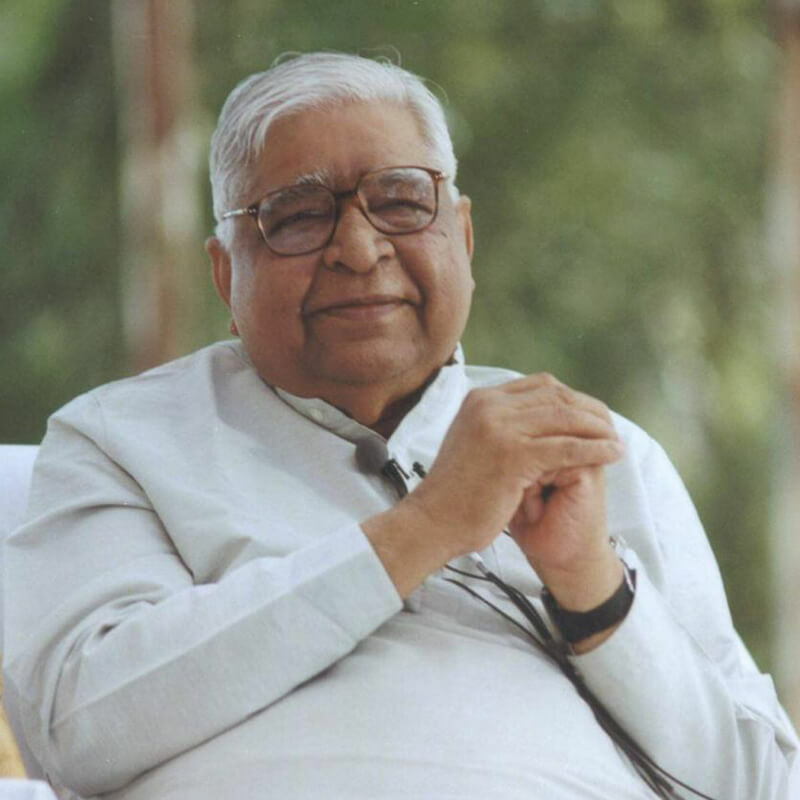 Param Pujya Shri Satya Narayan Goenka, Global Acharya of Vipassana Meditation, passed away peacefully at the ripe age of 90 at his residence on Sunday, 29th September, 2013 at 10:40 PM. The following video contains his funeral procession.